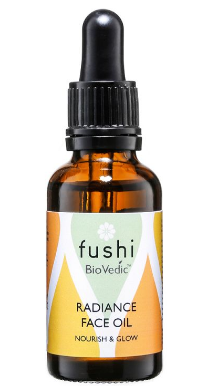 A nourishing face cream from Fushi to hydrate and revive your skin. 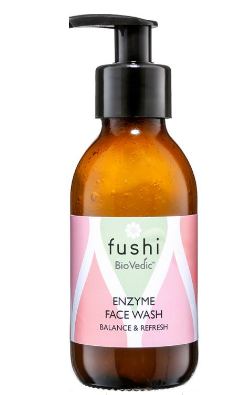 Perfect for dull skin complexions, use to rejuvenate tired looking skin. Includes Ayurvedic herb Manjisthta to promote long term skin radiance, age-defying Kalahari Melon seed to boost your skin's elasticity and moisture together with Rice Bran oil which is rich in sterols, protective and a penetrative oil that sinks into the skin's dermis and keeps it supple and soft all day. Ingredients are freshly pressed for optimum performance. Absorbs rapidly and leaves supple, radiant, soft skin. 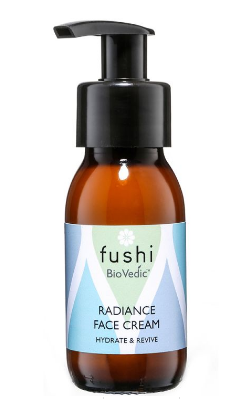 How to use Fushi's Biovedic Radiance Face Cream; Gently massage into clean skin on your face and neck until absorbed. Can be used day and night. For normal to sensitive skin types. This product is natural so use within 6 months of opening. External use only. Packaging; Recyclable glass bottle. Check local recycling for the pump dispenser.